During October 2001 a salvage excavation was conducted in the center of Kafr Nein, c. 100 m west of the mosque (Permit No. A-3501*; map ref. 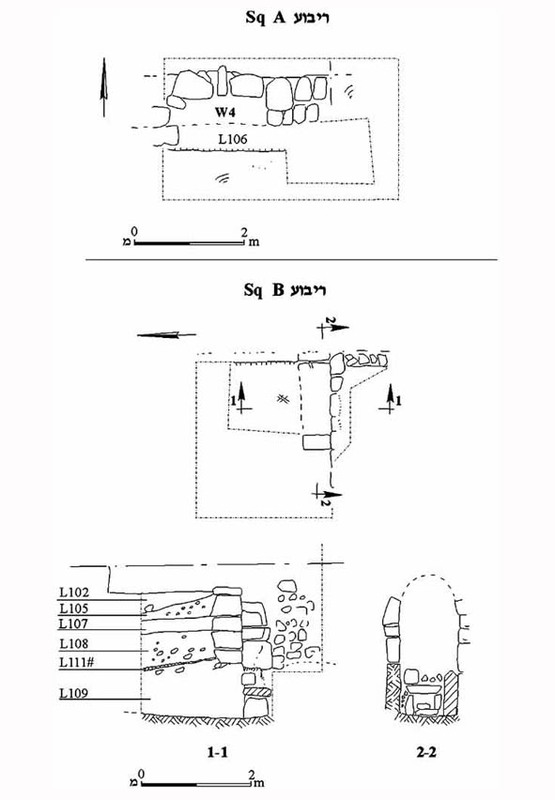 NIG 23290–5/72615–20; OIG 18290–5/22615–20), following damage to antiquities caused by mechanical equipment. The excavation, on behalf of the Antiquities Authority, was directed by R. Abu Raya, assisted by H. Tahan (drawing) and E.J. Stern and D. Avshalom-Gorni (pottery reading). Two squares (A, B; Fig. 1), revealing antiquity remains from the Umayyad, Crusader-Ayyubid and Mamluk periods, were opened. Square A (2.5 × 3.0 m). The foundation of a wall (W4; width 0.9 m), built on hewn bedrock and preserved 1.1 m high, was discovered. The wall was built of medium and large fieldstones (0.2 × 0.3–0.4 × 0.7 m) and paralleled a rock-hewn step to its south. The fine-particle gray soil accumulation in the space (L106) between W4 and the bedrock step contained ceramic finds, dating to the Crusader and Ayyubid periods (twelfth century–beginning of thirteenth century CE). The assemblage included locally produced glazed bowls (Fig. 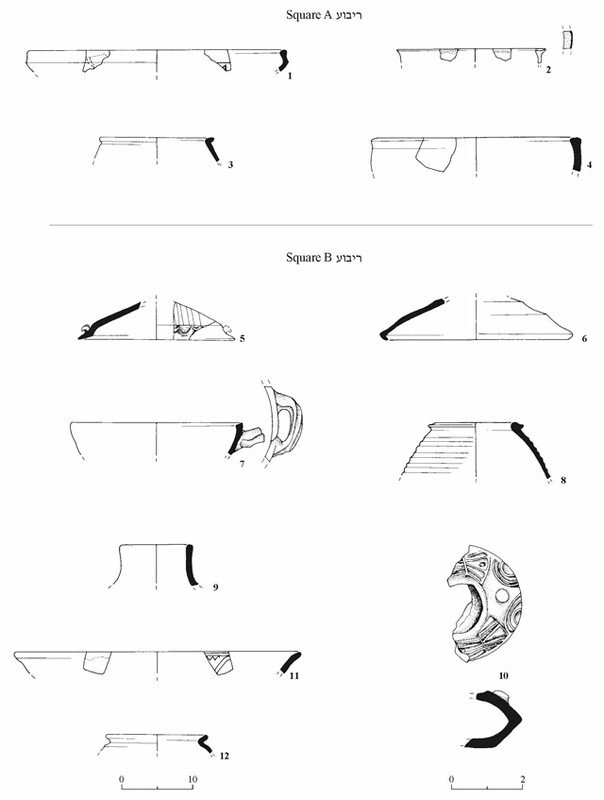 2:1, 2), a cooking pot (Fig. 2:3) and a handmade monochrome bowl decorated with red painting (Fig. 2:4). Square B (3 × 4 m), c. 10 m west of Sq A, consisted of an arched entry (width 1.1 m, depth 0.55 m, reconstructed height 2.5 m). Above its two preserved rock-hewn doorjambs, an arch was constructed; four of its ashlar stone courses were preserved on each side (the largest of the stones c. 0.3 × 0.5 × 0.5 m). A stone-built channel (width 0.4 m, height 0.3 m) was discovered in the floor of the entry, its function unclear. A curved wall built of medium-sized fieldstones (0.2 × 0.3 m) was exposed for a length of 1 m and abutted the southern side of the eastern doorjamb. A crushed chalk floor (L111) abutted the entry from the north. It sealed a layer of fine gray soil fill (L109; thickness 0.8–1.0 m) that rested on a rock-hewn surface. A stratified accumulation (Loci 105, 107, 108) on top of Floor L111, rising as high as the top of the doorjambs and sealed by a layer of well tamped earth that contained stones and mud-brick fragments (L102), was discovered. The accumulation layers contained homogenous ceramics, dating to the seventh–eighth centuries CE. The finds included vessel types characteristic of the Umayyad period, alongside types that continued traditions from the end of the Byzantine period, e.g., two types of cooking pots, open and closed (Fig. 2:7, 8); two lids, one of an unknown type decorated with finger impressions and red lines (Fig. 2: 5) and the other, a plain type (Fig. 2:6); a jar with a plain rim and tall neck, familiar at the beginning of the Umayyad period (Fig. 2:9) and a mold-made lamp of light colored clay, bearing a geometric inscription (Fig. 2:10). Fragments of glass vessels that typified the Umayyad period were found as well. Locus 102 yielded fragments of pottery vessels, such as a bowl with green and yellow glaze, decorated in sgraffito (Fig. 2:11) and a cooking pot of light colored clay (Fig. 2:12), both vessels characteristic of the Mamluk period (end of the thirteenth–fourteenth centuries CE). Previous excavations at Nein (HA 61–62; ESI 16, 20; HA-ESI 112) had shown that the place was inhabited during the Middle Bronze Age, Iron Age, and the Roman, Byzantine, Early Islamic, Mamluk and Ottoman periods. The results of the present excavation indicate that the settlement in this part of the village had developed only from the Umayyad period on, when it expanded westward. 1. Squares A and B, plans and sections.